Premier Roulette is not the average Joe of Roulette games. While it is based on a European style of playing with all the standard features, there are also more exotic bets to choose from. 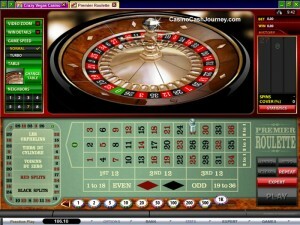 It is also a highly customizable game which allows the player to experience Roulette exactly the way he or she likes it. Premier Roulette really is on a whole new level. The layout of features and operating buttons are arranged in a much more user friendly and ordered way. This not only contributes to a better visual aesthetic but makes navigation through the game easier. Players are treated to custom settings as well as an exceptional 3D graphic format. The Table Layout and Roulette wheel lie side by side and the table layout can be used to place the inside and outside bets while the wheel layout can be used to place the call bets and split bets. Players can also save their favourite bets. If you favour a lucky number combination, you can save it so that you don’t have to start fresh with that bet each and every time. You can save up to 5 bets and can also choose to play on Turbo Mode. You can also change the background colour of the Roulette table and have the opportunity to zoom in closer to the table once the wheel has stopped spinning. Exotic bets are also another bonus in Premier Roulette. These include Red Splits, Black Splits, Les Orphelins, Zero Game, 007, Snake, Random 7 amongst others. The game is available for both Instant Play as well as for download and there are two speeds to choose form. You can choose to also play in Expert or Regular mode, and if you pick the Expert Mode option you can take advantage of the Autoplay feature.